Robert Lee Lynch, “Bob”, was born on October 10th, 1925 to parents John and Julia (O’Connor) Lynch in the small farming town of Conception, Missouri. He was the fourth of 11 children. He worked hard earning money by harvesting crops or as clerk at the hardware store which he then gave to his Mother to help support them. In his senior year he was drafted to serve in World War II. Before he reported for duty, he married Eva Mae Keever on January 12th, 1944 in Maryville, MO. Bob left for Europe in November 1944 and then his daughter, Joyce Elaine was born. 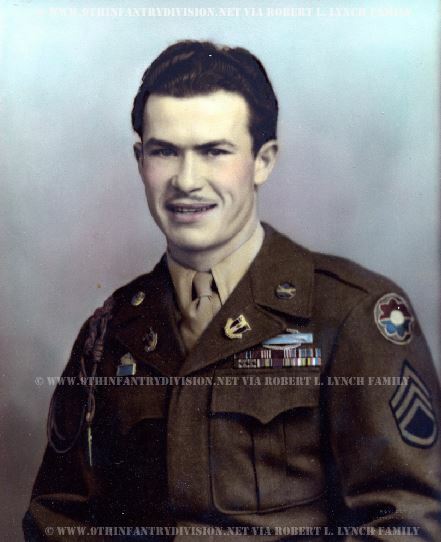 Assigned to Company B, 60th Infantry Regiment of the 9th Infantry Division, then Private First Class Lynch fought in the Battle of the Hurtgen Forest, the Battle of the Bulge and helped capture the Remagen Bridge. He also met Soviet patrols at the Elbe prior to the invasion of Berlin. Promoted to Staff Sergeant, Bob Lynch earned three Bronze Stars, the Belgium Fourragere and the Presidential Unit Citation. 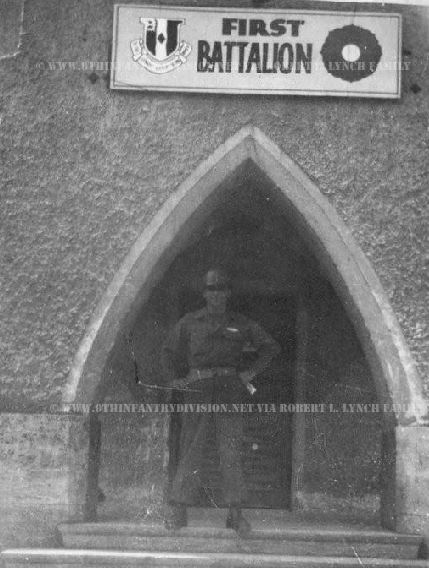 A war buddy standing in front of the First Battalion sign, showing the 60th Infantry Regiment DI and the 9th Infantry Division “Octofoil”. It wasn’t until January 1946 that Bob was home and got to meet his daughter Joyce for the first time. After a few years in CO he bought a small dump truck and drove to Vista in 1953. Using his ingenuity and “can do” attitude he built his new trucking business, with his wife by his side, hauling material all over three counties. In his opinion, no job was too small. Many local organizations benefited from his generosity. You could always find him in his green service truck or on the loader, never afraid to roll up his sleeves and get dirty. He always got the job done, no matter what. A true Irishman he always had time to “shoot the breeze.” He mentored many, and treated his truck drivers like family. Lynch Trucking’s green fleet moved to what is now Business Park in the 1970’s when it was just beginning . He excavated the hills to make way for VID and other buildings. Some land was exchanged for income properties to provide for future generations and prepare for retirement. It was a true family business, where generations learned from “Pa” as he was lovingly referred to. His example gave each family member a road map for a successful life. In 2012 I found a 9th Infantry Division 4 pocket World War 2 jacket on Ebay, and the name of the veteran it belonged to looked familiar. After some research it turned out to be the jacket that belonged to Bob! I contacted his daughter, and told them about the jacket. After receiving the jacket I kept in touch with the family to make sure we all had a clear understanding of all the insignia’s, medals and pins, where to place them, and then the family had a surprise in store for Bob. On a Sunday afternoon in December 2012, Bob’s 19 years old great grandson David wore a complete uniform with the jacket, and walked into the livingroom while the rest of the family was there as well. Some war stories were being told, and then Bob’s family asked to try on the jacket. It fitted perfectly! Then, after some more stories, they asked Bob to read the name that was written inside the jacket out loud. He slowly read his name, in a dead silent room. Not really understanding what was going on, his granddaughter Michelle explained Bob that after all these years they found his jacket, the same jacket he wore nearly 70 years earlier! 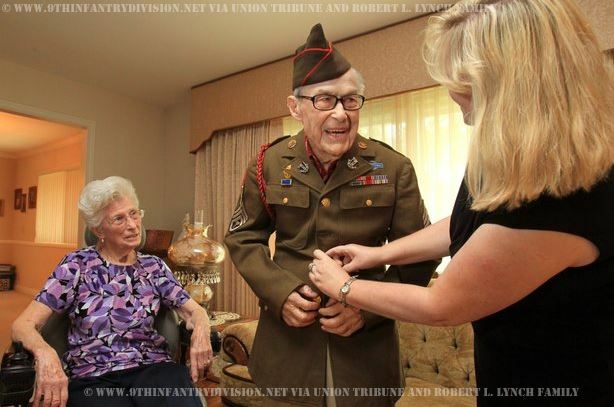 Staff Sergeant Robert Lynch shows a big smile after trying on his old jacket after nearly 70 years. Bob enjoyed Sunday dinners, lunch dates, and drives with his sweetheart, Eva Mae. In fact, one week before his passing, they celebrated their 71st wedding anniversary. He supported every grandchild in their school, sports, and dance events. Staff Sergeant Bob Lynch passed away on January 19th, 2015, reaching the age of 89 years. Bob will be missed greatly by his whole family, truck drivers, business associates, the community, and his many friends. Personally, it has been very special to have been a part of getting the military jacket back to Bob after all these years, and I often look at the picture. The smile says more than words. Bob has a very special place in my heart, and I will never forget what he has done to liberate my grandparents from the German Occupation, resulting in the freedom I can enjoy today. We will never forget him.